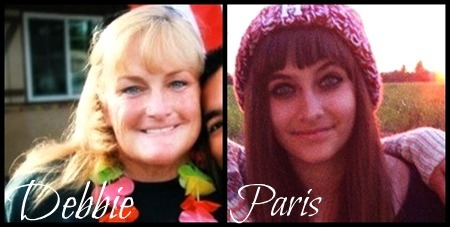 Paris and Debbie Rowe. . Wallpaper and background images in the প্রিন্স মাইকেল জ্যাকসন club tagged: paris jackson debbie rowe. This প্রিন্স মাইকেল জ্যাকসন photo contains প্রতিকৃতি, ধনু, and চতুর. Some people say Paris resmbles her mother Debbie but I disagree. I believe she resembles her father Michael and her aunts Janet and La Toya. People say Paris has blue eyes but the truth is she has green eyes...an inheritance she got from her Grandfather Joe. Michael spoke about this in Living with Michael Jackson documentary. I know Debbie was heart broken when Michael died. That was her husband and she TRULY loved him. I wish she could have gotten an interview with someone. So she could open up a little. She stood by Michael during his hard times...unlike his first wife Lisa Marie. She had a beautiful name but a terrible heart. She bashed And trashed Michael. She lied about their relationship. And then Michael died and she gets an interview with oprah or whatever her name is. She talked about how much she "loved" him. Yeah right! She can't fool me. She only did that interview to save her "career." Like she ever had one. I believe she's been MIchael to have sucess. Even being the daughter of a so called king can not bring attention to her. She had the fact that she was once a wife to Michael Jackson to promote herself. She is SHAMELESS. She's been using Michael to promote herself. She used the fact that she was once a wife to him to promote herself. She was only angry because Michael pushed her out of his life. I would not blame him. She tried to control his life and convert him to her cult religion scientology. He was done with her. And she used other guys to feel better about herself. If I was like her i'd feel insecure too.